Ystrad Mynach College, City & Guilds (Diplomas) in Piano Tuning/Rebuilding. GL Pianos & The Piano Warehouse was founded and established by certified piano technician and musician Garron R. Larcombe. What began as a 6 day a week tuning & repair service over 3 decades ago has now grown into a successful piano business offering New, Pre-owned and Vintage Pianos. In addition we offer Player Piano Systems and have a Full Service Piano Restoration Workshop. I would like to take this opportunity to say THANKS to the thousands of clients who have spread the word about my company GL Pianos for tuning, repair and restoration services. And thanks to all of the Schools, Music Teachers, Churches, and Professional Musicians for making 'The Piano Warehouse' the success that it is today. I am grateful for their support. wrote an article about my piano business. 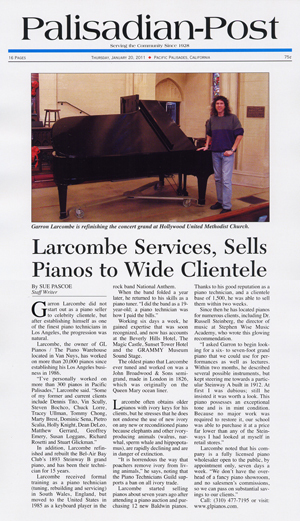 Garron Larcombe did not start out as a piano seller to celebrity clientele, but after establishing himself as one of the finest piano technicians in Los Angeles, the progression was natural. Larcombe, the owner of GL Pianos / The Piano Warehouse located in Van Nuys, has worked on more than 20,000 pianos since establishing his Los Angeles business in 1986. 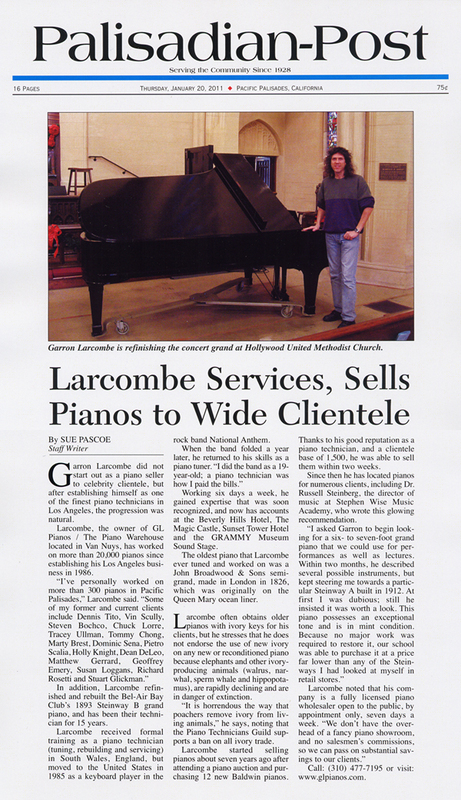 "I've personally worked on more than 300 pianos in Pacific Palisades," Larcombe said. Larcombe noted that his company is a fully licensed piano wholesaler open to the public, by appointment only, seven days a week. "We don't have the overhead of a fancy showroom, and no salesmen's commissions, so we can pass on substantial savings to our clients." 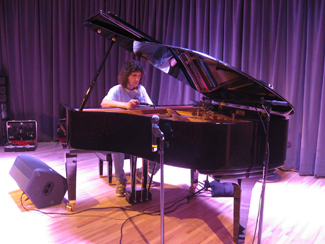 Originally from Wales, Great Britain, I began playing piano at the age of 8. A few years later I received a certificate in Grade V (Higher), in "Theory of Music" from the Royal School of Music and studied percussion at the Cardiff College of Music (I played percussion in a youth orchestra). By coincidence, years later I used to tune & prep pianos for the Royal School of Music for other students to take their exams. When I was 16, I started playing Hammond organs throughout night clubs in Wales. My interest in music then progressed into the technical aspects of pianos and I was accepted into Ystrad Mynach College (music dept.) in Wales. I studied at the college in their 2 year, full time program specializing in tuning and rebuilding pianos, along side guitar, harp & violin makers. This technical college is where I formally developed my skills and learned the art of piano craftsmanship. Upon graduation I received several degrees and diplomas from the City and Guilds of London Institute. I also became a member of the Institute of Musical Instrument Technology which is equivalent to being a RPT in the Piano Technicians Guild in the U.S. 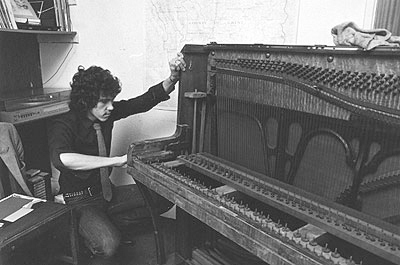 Shortly thereafter I started and operated my own piano service & rebuilding shop in Wales. Click on the Welsh Dragon. The local newspaper did a story about me when I was 19 years old (Wales, GB). piano because its a Birdcage/Overdamper; over 100 year old European piano. While working on pianos during the day, I also continued to play keyboards and was approached by other musicians to form a group and tour the states. This took me to Los Angeles and our rock band 'National Anthem' was semi-successful playing numerous clubs and gigs throughout L.A. and Las Vegas. In the years that followed, the band members went their separate ways. Since music was my life, I decided to develop my own recording studio here in Los Angeles. In 1986 I created and established SoundTrack Studio and became a member of BMI as a music writer and started GRL SoundTrack Publishing (BMI). I worked for many production companies, directors, etc. Not only was I scoring music by night, I was also running my own piano business by day. For nearly a decade I produced music for the T.V. and film industry in Los Angeles. A few of my credits include scoring music for motion picture trailers such as; 'Flatliners', 'Narrow Margin', ‘Inside Edge’, 'A Nightmare on Elm Street 5', 'Who's Harry Crumb? ', 'Best of the Best 3', 'Vampire's Kiss', etc. I was also the original music composer/producer (for 6 years), for the 'Genesis Awards' show which airs on the Discovery Channel every year. Eventually, running 2 different businesses became too demanding so I finally made the decision to concentrate my efforts on my piano business. I preferred it because it gave me the opportunity to personally meet and work with many people instead of being confined to my recording studio for long periods of time. Since moving to Los Angeles in 1985 I have tuned & serviced over 20,000 pianos (without exaggerating). I feel like I have worked for nearly everyone from major concert venues and theaters to the Los Angeles Mission downtown to famous restaurants & 5 star hotels in Beverly Hills. My client list includes many accomplished musicians, celebrities and well known people of interest. technician who wanted to tackle all the repairs & tune their very old and unique piano. Their Chickering Square Grand dates back to approx. 1870. They sent me this note with the photo. 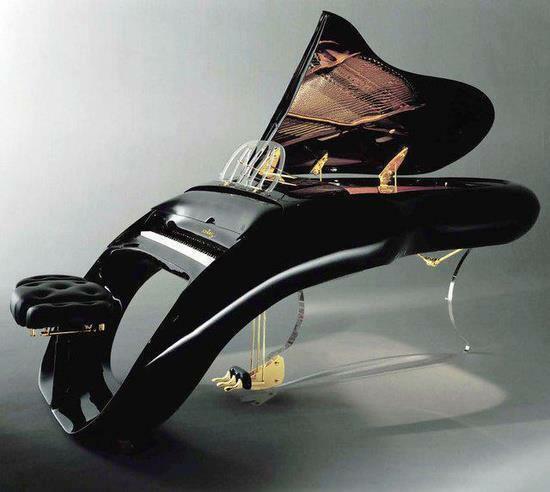 Over the years, I specialized in many antique pianos including Birdcage/Overdampers, Square Grands & Viennese pianos. I have also worked on Player Pianos, Nickelodeons (with or without a keyboard), Electric Pianos (Fender Rhodes, Yamaha CP-70, Kawai EP-608, etc. ), Hohner Duo (Clavinet/Pianet), Autoharps, etc. The oldest piano I have tuned & worked on was a John Broadwood & Sons Semi Grand, serial # 10433 which was made in London in 1826 and was originally on the Queen Mary ocean liner. 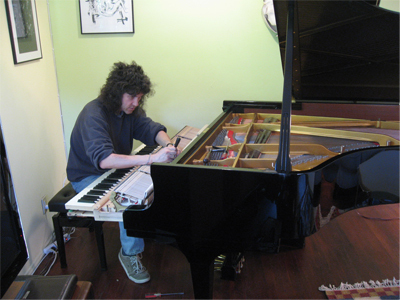 One of the most unique (and expensive), pianos I have worked on was a Schimmel/Colani "Pegasus" Grand. There were only 14 of them made and they retailed for $200,000.00 each. As well as tuning and servicing Mr. Neil Portnow's Baldwin Baby Grand piano - President/CEO of The Recording Academy (NARAS). 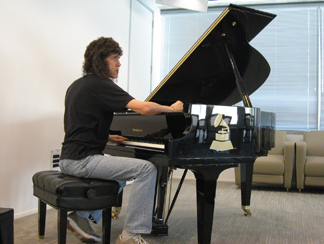 I also take care of the pianos at The Recording Academy and The GRAMMY Museum. The photos above were taken June 2010 at The Recording Academy - Los Angeles and October 2010 at The GRAMMY Museum (on their sound stage) - downtown at 'L.A. Live'. I have been tuning and maintaining their pianos for many years. At the time, I happen to be tuning the sound stage piano (for many artists), for the 'Songwriters Hall of Fame' 3 day Grand Opening event. schools, churches, famous musicians, etc. Great Service and Quality Pianos at Affordable Prices.